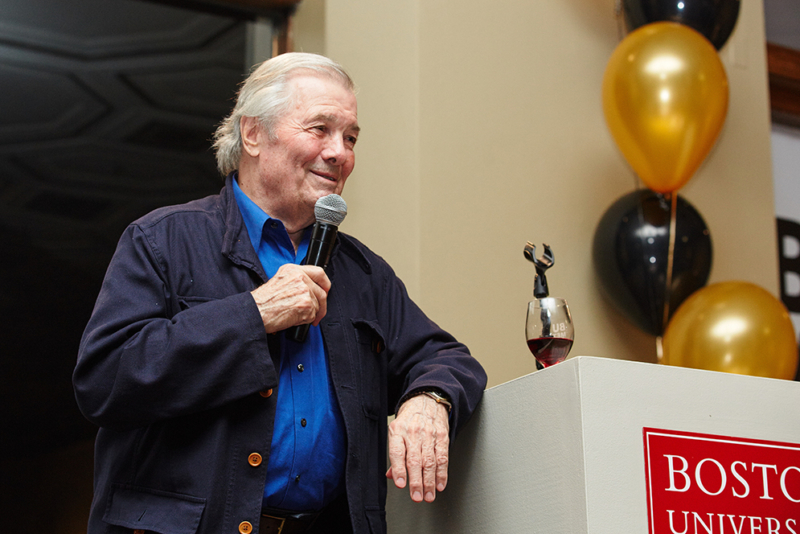 Jacques Pépin has chosen two non-profits, Boston University’s Programs in Food & Wine and Wholesome Wave, to each receive a $25,000 grant from The Julia Child Foundation for Gastronomy and the Culinary Arts (the Foundation). The Jury for the Julia Child Award named renowned chef, cookbook author and culinary personality Jacques Pépin as its first-ever recipient in August. These grants are made in recognition of this honor. “Wholesome Wave is a unique and extraordinary program that supports low-income families and gives them access to fresh, healthy produce from farmers’ markets. This is a worthwhile and much needed program that has my full backing,” Pépin added. The annual Julia Child Award honors an individual who has made a profound and significant difference in the way Americans cook, eat and drink. The Foundation will make $50,000 in grants to food-related non-profits chosen by the recipient as part of the Award’s recognition program. “The Foundation is delighted to support Boston University’s Programs in Food & Wine and Wholesome Wave. Furthering the significant contributions Jacques has already made to these organizations and fostering their valuable work in educating future culinary leaders and expanding opportunities for everyone to eat better food is what the Julia Child Award is all about,” said Todd Schulkin, Executive Director, The Julia Child Foundation for Gastronomy and the Culinary Arts. “We are honored Jacques has chosen Boston University’s Programs in Food & Wine as a recipient of a Julia Child Award grant. During the 30 years Jacques has been teaching in Boston University’s Culinary Arts and Gastronomy Programs, he has had a profound and significant impact on the lives of countless students,” said Potter Palmer, Director, Programs in Food & Wine, Boston University Metropolitan College. “We are so humbly honored that such a respected culinary visionary has chosen Wholesome Wave as one of the beneficiaries of this prestigious Award. Jacques and I share a dream of seeing the day when all people, regardless of income, can put fresh, healthy food on the table for their families. This award will go a long way in helping Wholesome Wave provide affordable access to fruits and vegetables for families struggling with poverty,” said Michel Nischan, Founder, CEO & President of Wholesome Wave. Mr. Pépin will be presented with the Julia Child Award on October 22, 2015 at a Gala held at the Smithsonian’s National Museum of American History in Washington, D.C. The Gala benefits Smithsonian Food History programs and kicks-off its inaugural Smithsonian Food History Weekend, October 23-25, 2015. French Chef Daniel Boulud, chef-owner of many award-winning restaurants around the world including Michelin starred DANIEL in New York City, will present the Award to Mr. Pépin during the Gala. More information about the Julia Child Award, the Award criteria and selection process, can be found at juliachildaward.com. Through a variety of seminars, tastings, demonstrations and hands-on cooking classes for both adults and children, Boston University’s Metropolitan College Programs in Food & Wine put students face-to-face with some of the most talented chefs, wine experts, and food industry professionals in the industry. BU’s Certificate Program in Culinary Arts is an intensive, fourteen-week, hands-on cooking program co-founded by two of the world’s most influential culinary figures, Julia Child and Jacques Pépin. The Elizabeth Bishop Wine Resource Center at Boston University offers a Wine Studies Program, with four levels of study, and three levels of certification, led by instructors who include Masters of Wine and specialists in the wine trade. Wholesome Wave is a 501(c)(3) nonprofit that strives to create a vibrant, just and sustainable food system. By making fresh, locally grown fruits and vegetables affordable and available, it inspires underserved consumers to make healthier food choices. Its innovative initiatives are improving health outcomes among low-income families, generating additional revenue for small and mid-sized farm businesses and bolstering local and regional economies. Implemented nationwide in collaboration with communitybased partners at farmers markets, community health centers, hospital systems, food hubs, and retail outlets, its initiatives reach more than 50,000 underserved consumers and their families, as well as thousands of farmers annually. The Julia Child Foundation for Gastronomy and the Culinary Arts was created by Julia in 1995 as a grant giving private foundation. Through its support of other non-profit organizations whose work advances matters Julia valued, the Foundation honors her lifelong love of learning, her far-reaching impact as a teacher and mentor, and her passion for gastronomy and the culinary arts.